If you have ever wondered if beer has a rating system based on its attenuation of light through the liquid, there is. The Standard Reference Method (SRM) is utilized by brewers across the globe because it provides a consistent and in-depth system for consistent measurements into the look and profile of your beer. Color is one of the most noticeable traits of any brew, and can help you decipher a lot about the beer’s flavor. The Herkimer is here to help drinkers of all skill levels find the right beer for their tastes, and our brewpub in Minneapolis relies on small-batch brews to do our talking for us. 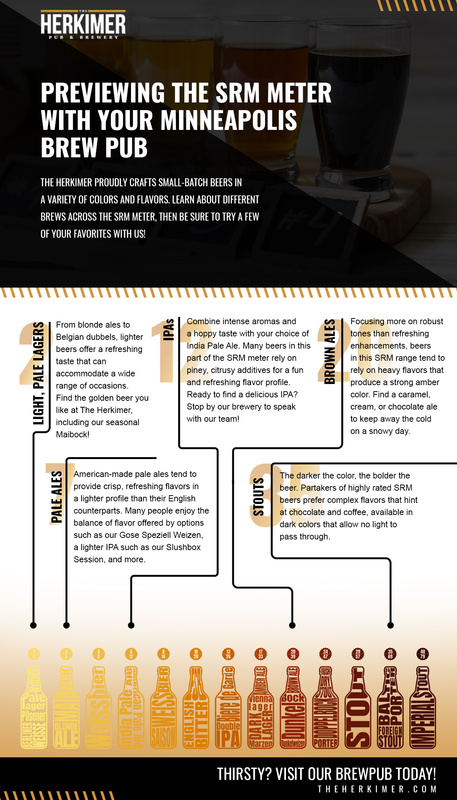 Today, we’ll preview a few different colors present along the SRM scale, as well as some corresponding brews to get you ready for happy hour. 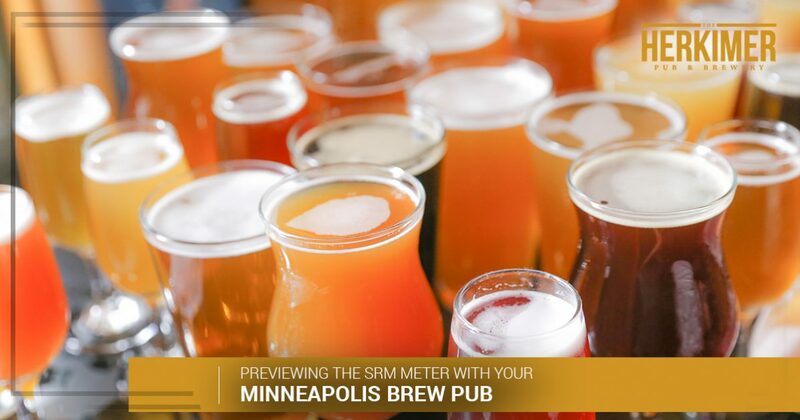 No matter your beer preferences, it helps to understand where your beer fits in the SRM scale. It can to remember that this value ranges from 0 to 40, with the higher numbers yielding much darker beers. Beers that are lighter in color (think blonde ales) tend to end up on the lighter end of the scale, allowing much more light to pass through. These lighter lagers and ales boast a simple flavor profile that is easy to sip and appreciate. Many light beers add fruit, spices, and honey to upgrade the brew for a robust flavor that hits most taste buds. Many beers are available that rate lighter on the SRM scale. Unlike English pale ales, which are nuttier and more robust, American-made brews tend to boast a clean, crisp flavor. Our refreshing beers are available in many styles and flavors, and pale ales tend to be among the populace’s favorite. Those looking for a hoppy taste with an intense aroma can find the right level of perfection in this range. Many India Pale Ale brews feature a range of color and flavor profiles, allowing you to mix and match the right one for your pallet. The Lutz West Coast IPA from our brewpub, for example, provides a full profile of citrusy, floral, piney, and fruity flavors. Some individuals prefer a robust flavor that is rich and heavy on the tongue. Many beers (Dunkels and Weizens included) in this range delve more into creamy profiles that focus on the spice of the beer over anything else. The darker the color, the bolder the beer. Many fans of our Minneapolis brewpub visit our establishment to sip from a variety of rich, robust flavors. Our Tropical Stout, for example, combines dark coffee, chocolate, and notes of molasses to deliver an amazing aroma and flavor. Sweet, then dry. Refreshing! If you’re thirsty after catching up on this blog post, keep in mind that our craft beer pub is open until 2 a.m. and we’re ready to pair the perfect beer with one of our delectable meals. Contact us today to learn more, and be sure to stop by our brewpub on Lyndale Avenue South for a smooth drink!